“Self-Help Housing” involves groups of local people bringing back into use empty properties that are in limbo, awaiting decisions about their future use or their redevelopment. It differs from “self-build housing”, which involves constructing permanent homes from scratch. Self help housing groups negotiate with the owners of empty properties for their use and then go on to organise whatever repairs are necessary to make them habitable. These are normally groups of people who can’t afford to buy their own housing and whose housing needs are such that they will not be offered a permanent tenancy by the local authority or a housing association ( eg all sorts of single people, couples, young people, refugees etc). The properties are often “borrowed” on the basis of a licence or sometimes a lease, for a specified period of time. On occasion, future plans change and the buildings may even become available on a permanent basis. 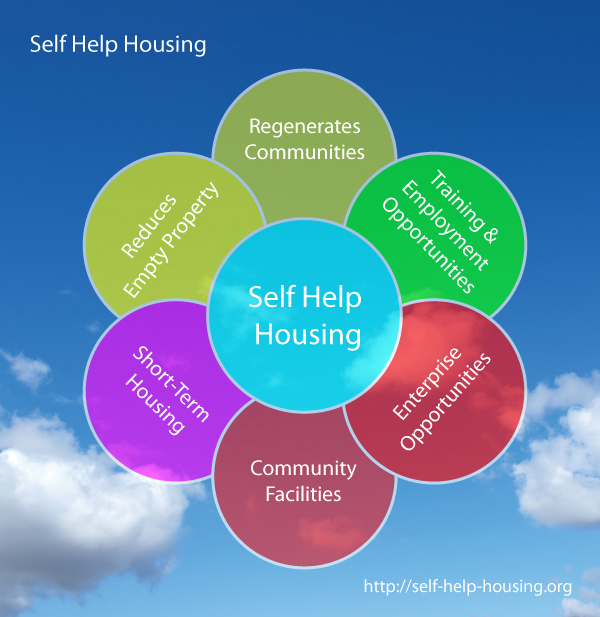 See How Does Self Help Housing Work? for an overview and Self Help Housing – How It’s Done for details of how to get going. Self-Help Housing Is A “Win-Win” Activity! Self-Help Housing utilises empty or redundant buildings which owners are willing to make available for a limited period on licence or lease, often at minimal cost. .
Self-Help Housing is a source of economical and affordable housing, or community facilities, for people who might otherwise be homeless or have to share accommodation. Self-Help Housing enables people, to take responsibility for securing their own housing or developing their own community facilities. It turns people into active citizens. In addition to providing affordable housing and community facilities, self-help projects can sometimes generate cheap work space for start-up businesses and social enterprises. Self Help Housing provides people with an opportunity to learn practical “on the job” building skills and also how to run an organisation, how to secure funding and how to negotiate with owners, local government officials and other agencies.